Photo courtesy of The Ontario Table by Lynn Ogryzlo. 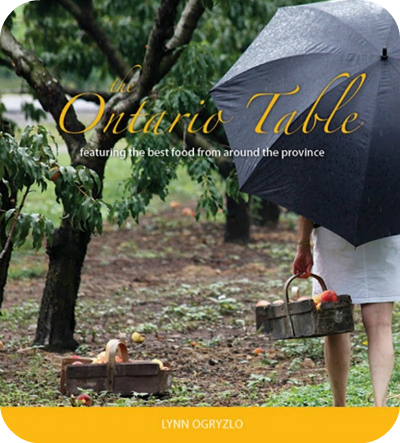 The Ontario Table is not only a cookbook by Lynn Ogryzlo but an account of a two-year journey of Lynn and her husband Jon, through our great province. From Windsor to Niagara Falls Ontario to Ottawa, the couple trekked through the valleys and fields of our region while researching homegrown food. Today I want to share with you one of Lynn’s amazing local recipes from her book. As an added bonus I’ve selected one of the recipes featured in Lynn’s Essex County section to make it more relevant to the town that Whispered Inspirations is based out of, Windsor. But first I want to touch on the importance of buying local, and the eye-opening experience I had a few weeks ago. Recently I attended an event here in London called Farmers Feed Cities. It was an evening of socialization, education and dining on local fare. What I learned that evening has changed my view on food in general and my view on the importance of buying local. On this evening we learned about local goat milk farmers, garlic famers, egg farmers and even Elk farmers. And I am pleased to share that I actually tried a piece of Elk (I’m usually NOT that adventurous when it comes to my meats) and it was actually quite tasty and not at all gamy contrary to common belief. Sadly, I also learned some upsetting things; while we grow some of the best garlic in the world right here in Ontario, we are not able to buy it in our local big-name grocery stores. The garlic we see on shelves here is usually from Argentina or China and our local garlic, well it can be found (sometimes) in the ‘specialty’ and ‘gift’ section of the store. Isn’t that just crazy? Even worse, the garlic grown overseas is produced and cared for using a form of radiation to prolong its self life; they call this irradiated. What’s worse is that there is no law that states food has to be labelled this way telling us it’s been treated. This topic can be really overwhelming. At first I felt helpless. How can one single person make a difference? But the truth is that one person and one family can make a difference and we can start today. Try the $10 Challenge for just one week and see how that goes. Choose one family staple to vow to buy local and increase from there. Research your local farms and the markets they distribute to and make a weekend adventure out of it. Get connected with local resources. Follow @FarmsFeedCities, @ontariotable and @lynn_ogryzlo on Twitter. Find your local farmers at Essex County Farmers’. Now onto the tasty recipe! This recipe can incorporate many local ingredients like Canadian eggs, Ontario grown corn syrup and local salt. Check out windsorsalt.com, an internationally successful company with a plant Essex County. Preheat oven to 325 F (120 C). In a large bowl, beat the cream cheese and sugar at medium speed until smooth. Beat in eggs, 1 at a time, then sour cream. Beat in the sour cream. Pour batter into six ramekins or custard cups. Set the ramekins in a small pan and set the pan in the centre of the oven. Add enough hot water to the pan to reach halfway up the sides of the ramekins. Bake the cheesecakes 15 minutes, or until set. Turn off the oven and leave cheesecakes in for 1 hour. Transfer the ramekins to a rack and let cool completely. Store in the refrigerator until ready to use. Meanwhile, in a heavy-bottomed medium saucepan, heat the corn syrup. Stir in the sugar and cook over moderately high heat, undisturbed, until a deep amber caramel colour forms, about 10 minutes. Remove from heat and stir in the butter. Stir in the cream in a thin stream. Transfer caramel to a heatproof pitcher and allow cooling. Pour caramel over each cheesecake and refrigerate. 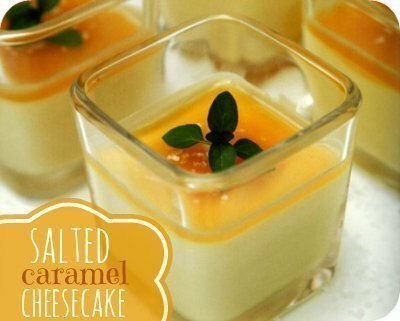 When ready to serve, sprinkle coarse salt over each cheesecake and top with mint sprigs. Kelly Connor is a 30-something mama to one exuberant little girl. Together Kelly and her husband are raising their daughter in an urban setting in downtown London, Ontario. Kelly blogs at citymom.ca and is the host of City Mom on Rogers TV. Follow along with City Mom on Facebook, Twitter and Pinterest.